Please join us for our 157th Anniversary Gala on Saturday, October 21st. The Gala will be held at the Philadelphia Sketch Club, 235 S. Camac Street, Philadelphia, PA 19107, from 6 to 10 PM. You will have a fun time and get to mix with many prominent members of the artistic community. At the Gala, we will honor three of America’s top artists, Alan Fetterman, Al Gury and Signe Wilkinson, with the presentation of the Philadelphia Sketch Club Medal. Below is a notice of the event that will appear in the September issue of ICON Magazine. We are in the process of forming an Honorary Gala Committee whose membership will include many prominent individuals from the artistic community. The main job of the Honorary Gala Committee is to encourage people to attend the event. The Honorary Gala Committee currently includes: David R. & Holly Trostle Brigham (David is President and CEO of PAFA and Holly is an Artist); William R. Valerio, Director & CEO, Woodmere Art Museum; Lisa Tremper Hanover, Director & CEO, James A. Michener Art Museum;; and David Weiss, Vice President at Freemans, a specialist on the Antiques Roadshow and guest auctioneer for the Gala auction. Other prominent members of the artistic community will be added to this group. 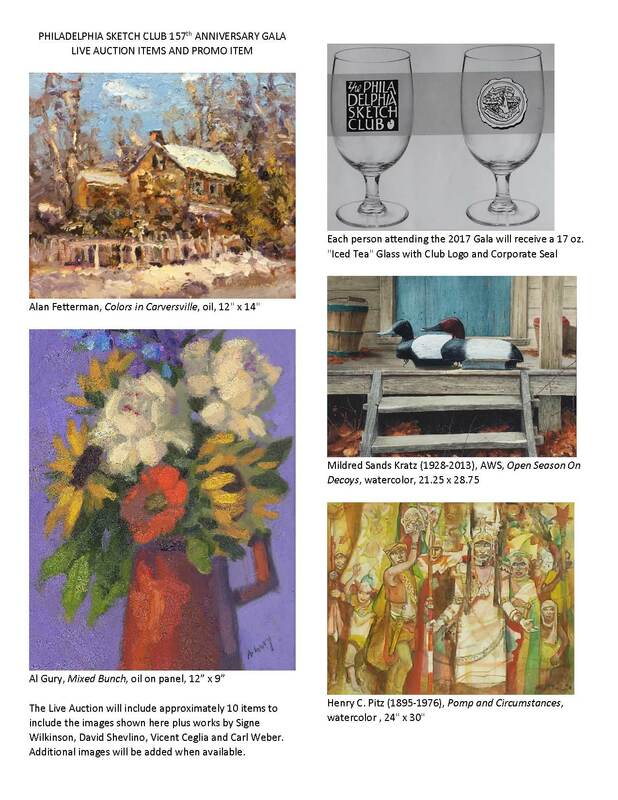 In addition to the medal presentations, highlights of the evening will include an unreserved live auction of artworks by the honored artists as well as some donated contemporary and historic works by Henry Pitz, Carl Weber, Mildred Sands Kratz, Vincent Ceglia and David Shevlino. There will be an open bar, hors d’oeuvres and a buffet dinner. You can order tickets at Purchase Gala Tickets or by calling 215-545-9298. Please order tickets promptly as we must provide a headcount to our caterer plus our capacity may be exceeded by the demand for tickets. To pay with a credit card, click on the Check Out button after you click the Add to Cart button above. Artist (Sketch Club members only): $60 ($35 is tax deductible). A member may also purchase one ticket for a guest at $60. The Philadelphia Sketch Club will honor three of America’s top artists, Alan Fetterman, Al Gury and Signe Wilkinson, with the presentation of the Philadelphia Sketch Club Medal.